The aroma of a freshly brewed cup of coffee in the morning, a hot shower before you go to bed: with the Truma LevelCheck you'll always know just how much propane is available in the tank. The Truma LevelCheck determines the level in your propane tank using ultrasound technology. It's easy to use, reliable, and is perfect for your BBQ, RVing, and camping. Extremely accurate. No more tapping on the tank and guessing. I love this thing! How Does the Truma LevelCheck Work? 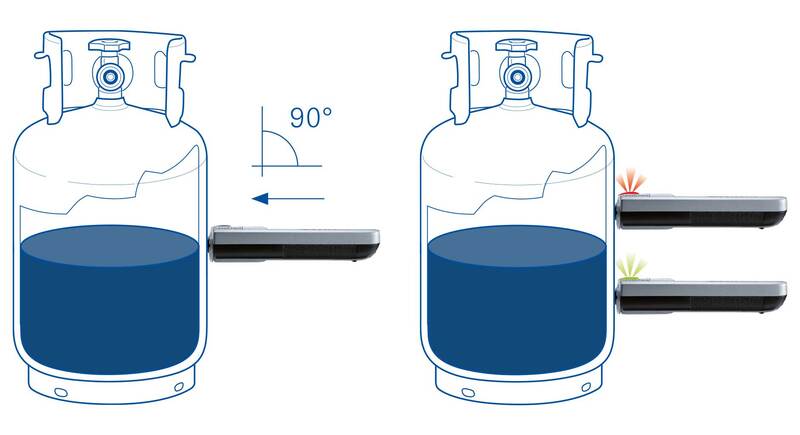 To measure propane level, press the Truma LevelCheck against the wall of the LPG tank horizontally at a 90° angle. The fill level is determined using an ultrasound signal. If there is LPG at the measured area, the signal is echoed by the opposite wall of the tank. This measurement is indicated by a green LED and a high-pitched "beep". If there is no LP at the measured area, the signal is not echoed back. This is indicated by a red LED and a lower-pitched "beep". Press the Truma LevelCheck horizontally to the wall of the gas cylinder at an angle of 90°. If there is liquefied gas in the measuring range, the result is shown by a green LED. Otherwise, the LED is red. In order to obtain a reliable measurement, the measuring head must be cleaned regularly with a wet cloth (do not use any cleaning agents). A soiled measuring head can result in inaccurate measurements. Dust particles often stick to tanks, particularly aluminium ones, which interfere with the measuring procedure. Soiled or rusty LPG tanks also tend to be difficult to measure. Cleaning or measuring in a different location on the tank usually produces the desired result. It is not possible to take measurements on plastic cylinders (because the signal is not echoed), gas tanks or fillable gas cylinders (because of internal components that deflect the signal). How do I know whether I have a reliable measurement? You should get a result in approximately 1-2 seconds. With a short measuring time, the device has a clear signal and the indicator (green) for the filled area or (red) for the empty area is reliable. A longer measuring time between 3 and 10 seconds is an indication of an unclear signal, which will result in a red indicator (erroneous measurement). Measurements taken in the lower area of full gas cylinders often fail. This is because of the restricted reflection of the echo from the distant surface of the liquid gas. Find a Service Center or Certified Dealer to Schedule your RV for a Truma Upgrade!